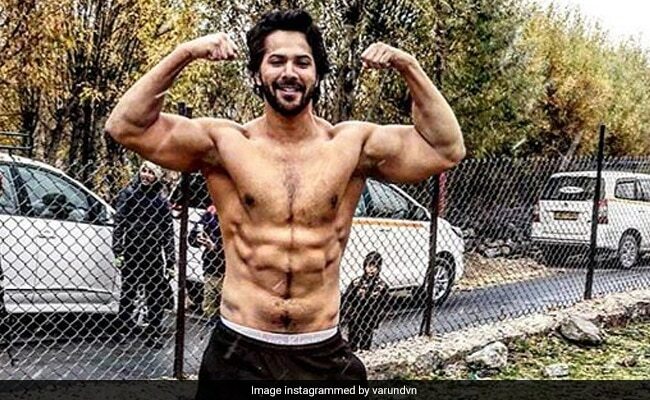 Varun Dhawan's Kargil schedule for his upcoming film Kalank was extremely intense and a post shared by the actor on his Instagram timeline is proof. For his role in the Abhishek Varman-directed film, the actor had to undergo intensive training. In a recent photo shared by Varun on Instagram, the actor showcased his well-chiseled body and talked about his experience of shooting in sub-zero temperatures. Shooting in minus degree temperatures is a task in itself and Varun had to give a shirtless shot in the freezing weather. "Kalank - was in for a huge surprise when it began to snow in Kargil. I have been training for a while but I was not sure how I would shoot bare body with the temperatures reaching -3 degrees. Prashant Sawant was by my side. God is great I managed to complete the scene rest is cinema history. Also Kargil is so beautiful," Varun captioned his photo. The photo shared by Varun Dhawan has over five lakh likes. Sonam Kapoor and Jacqueline Fernandez have also liked Varun's post on Instagram. Shilpa Shetty and Arjun Kapoor have left their precious comments on the photo. "Mauji the fauji," Arjun commented. Kalank also stars Alia Bhatt, Madhuri Dixit, Sonakshi Sinha, Sanjay Dutt and Aditya Roy Kapur. Karan Johar is the co-producer of the film. Kalank went on floors in April this year. Meanwhile, Varun Dhawan was in Abu Dhabi recently, where he shot a cameo for Salman Khan's Bharat. Though Salman and Varun have not shared screen space in any film so far, Salman made a cameo appearance in Varun's film Judwaa 2 last year. Varun Dhawan recently featured in Sharat Katariya-directed Sui Dhaaga, also starring Anushka Sharma. The film has collected over Rs 70 crore in two weeks.